The 2012-13 Wolves top x-country runners, Jamey Wigmore and Hayden Hollowell, continued their dominance on Saturday by posting wins and breaking school records in the 2nd Annual Rick(less) Scott Invitational Track Meet at the Eastlink Centre. Wigmore trimmed more than 3 seconds off of the Lovely Sara Scott’s 2008 GPRC record, posting a time of 2:32.02 in winning the women’s 800m. Wigmore also recorded a second win, capturing the womens 400m in 72.68. Hollowell bested teammate Eric Martinek in the mens 1000m in a time of 2:50.36, which was 3/4 of second better than Kyle Small’s 2008 GPRC record. John Murray won the mens 400m. The event was marred by the absence of meet’s namesake, Rick Scott himself, who was felled by the flu. Next up for the Wolves is the Golden Bear Open Meet in Edmonton next Friday and Saturday. A select group of GPRC athletes will compete. A full contingent of Wolves will contest ACAC Indoor Meet #1 in Edmonton on January 27th in Edmonton. 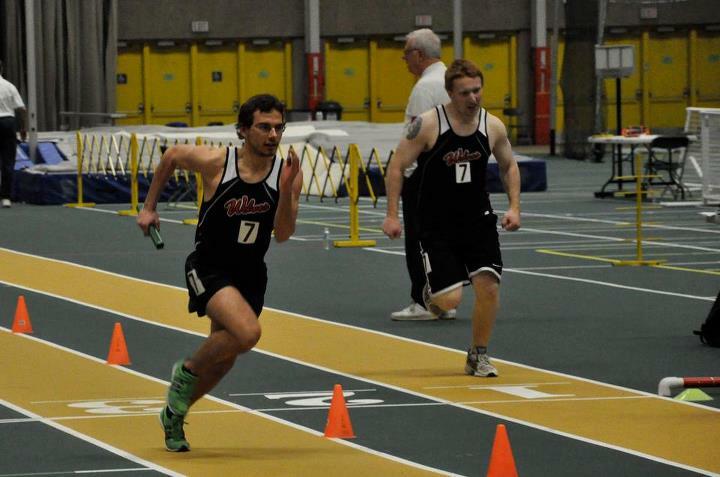 This entry was posted in Indoor Track and Field, Uncategorized and tagged 2013, ACAC indoor Track, Athletics, Eastlink Centre, GPRC Wolves X-C Running, Grande Prairie Alberta, Rick Scott, Rick Scott Invitational Track Meet, Wolves Athletics Club. Bookmark the permalink.